The future of priceless World Heritage sites depends on the immediate reduction of climate-change-inducing greenhouse-gas emissions, but many of the governments responsible for protecting these sites are failing to take strong climate action and are actively pursuing dirty energy projects. The future of priceless World Heritage sites like the Great Barrier Reef depends on the immediate reduction of climate-change-inducing greenhouse-gas emissions, but many of the governments responsible for protecting these sites are failing to take strong climate action and are actively pursuing dirty energy projects. Co-authored by Earthjustice Project Coordinator Noni Austin. Climate change has claimed another victim. Almost one-quarter of the coral in Australia’s Great Barrier Reef World Heritage Area—one of the world’s richest and most complex ecosystems—has died this year, in the worst mass coral bleaching in recorded history. Even in the far northern reaches of the Reef, long at a sufficient distance from human pressures like coastal development to preserve, to a large extent, coral health, a staggering 50% of the coral has died. The above-average sea temperatures that triggered this bleaching were made 175 times more likely by climate change. As the ocean continues to absorb heat from the atmosphere, large-scale coral bleaching like that which has decimated the Great Barrier Reef—not to mention other destructive phenomena spurred by rising temperatures—is likely to become even more frequent and devastating. The future of priceless World Heritage sites—and, indeed, our planet—depends on the immediate reduction of climate-change-inducing greenhouse-gas emissions. Yet many of the governments responsible for protecting these sites within their borders are not only failing to take strong climate action; they are actively pursuing dirty energy projects like coal mines and coal-fired power plants. Even as the Great Barrier Reef dies before our eyes, Australia continues to increase its exploitation of dirty fossil fuels. In the past year, the Australian government has approved both the massive Carmichael coalmine and the Abbot Point terminal, located near the Reef, to facilitate the global export of output from the Carmichael mine. The emissions attributable to the Carmichael mine will be some of the highest resulting from a single project anywhere in the world. And the problem isn’t limited to Australia. 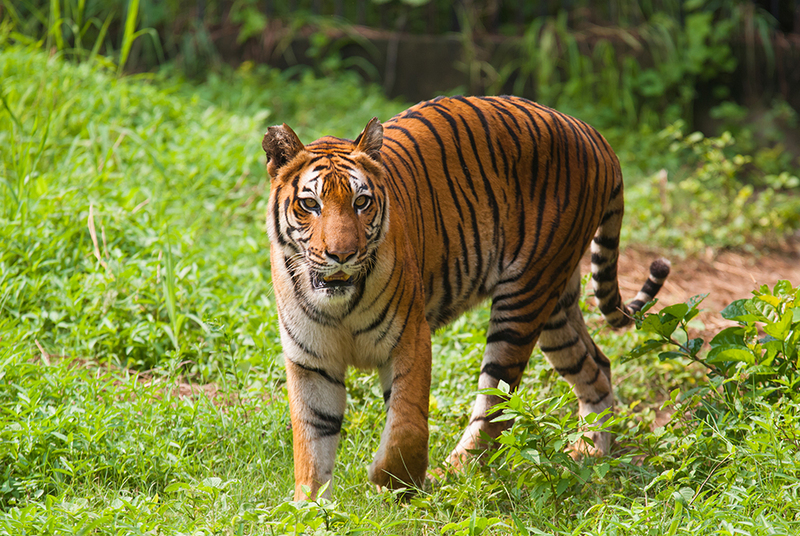 In low-lying Bangladesh, one of the countries most vulnerable to climate change, the government supports a proposal to build two huge coal-fired power plants adjacent to the Sundarbans World Heritage site. India, too, supports the proposal. Not only will these power plants emit large quantities of greenhouse gases; they will also devastate the Sundarbans, where the Ganges and other rivers meet the Bay of Bengal in a spectacular delta of mangrove islands that is home to endangered Bengal tigers and river dolphins. The power plants will pollute the waters with toxic coal ash, bring constant coal-barge traffic, and require the dredging of riverbeds. Mercury from the smokestacks will accumulate in the marine life, permanently contaminating the food supply of hundreds of thousands of people and vulnerable wildlife. A Bengal tiger photographed in the Sundarbans. It is true that Bangladesh is energy poor, a problem that must be addressed if it is to continue to develop economically. But there are alternatives. The country has significant potential for renewable-energy production, and it is already a world leader in rooftop solar energy. Of course, the responsibility to avert dangerous anthropogenic climate change does not fall only on countries that are home to World Heritage sites. But, knowing what we know today, initiating such damaging dirty energy projects is indefensible. With governments failing to protect our natural heritage, the World Heritage Committee must step up, in order to help bring an end to the relentless exploitation of fossil fuels. Specifically, the WHC should make recommendations to governments for reducing fossil-fuel-related threats, identify sites that are in particular danger from such threats, and carry out monitoring missions. The objective should be, first and foremost, to encourage governments with the capacity to reduce fossil-fuel-related threats to designated sites to take action. Such action from the WHC would also help to educate and empower civil society, while placing pressure on financial institutions to withhold the funding required for massive development projects. The WHC’s annual meetings, such as that which just ended in Istanbul, are the ideal forum for such an effort. Already, dozens of organizations and more than 60,000 individuals have called on the committee to urge India and Bangladesh to cancel the proposed coal plants and invest in renewable energy instead. Similarly, dozens of renowned scientists, NGOs, and international and Australian lawyers have demanded that the WHC counsel Australia not to continue supporting developments that will exacerbate the impact of climate change on the Great Barrier Reef. As the threat of climate change grows increasingly menacing, influential institutions like the WHC must take a stand against the toxic and insidious legacy of dependence on coal and other fossil fuels. If the committee remains silent on this crucial issue, World Heritage sites around the world will suffer. This blog was originally published by Project Syndicate on July 22, 2016. Martin Wagner leads the International program, specializing in taking corporations to court for practices that violate international human rights.